The function implies that the value of any negative number is always -1, the sign of 0 is 0, and the value of any positive number is 1. The sign of any complex number is the result when x is divided by its absolute value, e.g. sign(2i) = i. To find a value using the sign function, type "sgn" and enter the argument. If the argument is longer than one term, enclose it in parentheses. Find the sign of each number below. 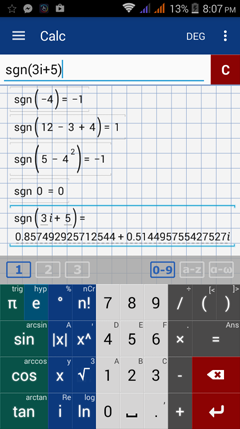 Switch to the a-z keyboard and type in "sgn" to calculate the signum of a number. Enter the argument in parentheses. Enter each expression with one expression per line. 1) sgn-4. Hit enter to go to a new line. 2) sgn(12 - 3 + 4). Hit enter. 3) sgn(5 - 4^2). Hit enter.